The Fleet Air Arm (FAA) is the branch of the British Royal Navy responsible for the operation of naval aircraft. The Fleet Air Arm currently operates the AgustaWestland Merlin, Westland Sea King and Westland Lynx helicopters. Helicopters such as the Lynx and Westland Wasp have been deployed on smaller vessels since 1964, taking over the roles once performed by biplanes such as the Fairey Swordfish. The Fleet Air Arm was formed in 1924 as organisational unit of the Royal Air Force which was then operating the aircraft embarked on RN ships – the Royal Naval Air Service having been merged with the British Army’s Royal Flying Corps in 1918 – and did not come under the direct control of the Admiralty until mid-1939. During the Second World War, the Fleet Air Arm operated both aircraft on ships and land-based aircraft that defended the Royal Navy’s shore establishments and facilities. By the outbreak of the First World War, in August 1914, the RNAS had more aircraft under its control than the remaining RFC. The main roles of the RNAS were fleet reconnaissance, patrolling coasts for enemy ships and submarines, attacking enemy coastal territory and defending Britain from enemy air-raids, along with deployment along the Western Front. In April 1918 the RNAS, which at this time had 67,000 officers and men, 2,949 aircraft, 103 airships and 126 coastal stations, merged with the RFC to form the Royal Air Force. On 1 April 1924, the Fleet Air Arm of the Royal Air Force was formed, encompassing those RAF units that normally embarked on aircraft carriers and fighting ships. 1924 was a significant year for British naval aviation as only weeks before the founding of the Fleet Air Arm, the Royal Navy had commissioned HMS Hermes, the world’s first ship to be designed and built as an aircraft carrier. Over the following months RAF Fleet Air Arm Fairey IIID reconnaissance biplanes operated off Hermes, conducting flying trials. On 24 May 1939 the Fleet Air Arm was returned to Admiralty control under the “Inskip Award” (named after the Minister for Co-ordination of Defence who was overseeing Britain’s re-armament programme) and renamed the Air Branch of the Royal Navy. At the onset of the Second World War, the Fleet Air Arm consisted of 20 squadrons with only 232 aircraft. By the end of the war the worldwide strength of the Fleet Air Arm was 59 aircraft carriers, 3,700 aircraft, 72,000 officers and men, and 56 Naval air stations. During the war, the FAA operated fighters, torpedo bombers and reconnaissance aircraft. Following the Dunkirk evacuation and the commencement of the Battle of Britain, the Royal Air Force soon found itself critically short of fighter pilots. In the summer of 1940, the RAF had little more than 800 fighter pilots and as the Battle progressed the RAF shortage worsened. There were simply not enough pilots, not enough ground crew, never enough sleep and too many enemy aircraft. With this desperate situation the RAF was forced to call upon the Admiralty for Fleet Air Arm assistance. As the Battle progressed, many of the unsung heroes of RAF Fighter Command were the Fleet Air Arm crews who served under Fighter Command, either loaned directly to RAF fighter squadrons or as with 804 and 808 naval units, entire squadrons were loaned to RAF Fighter Command, such as No 804 Squadron, which provided dockyard defence during the Battle of Britain with Sea Gladiators. In the waters around the British Isles and out into the Atlantic Ocean, operations against enemy shipping and submarines in support of the RN were mounted by RAF Coastal Command with large patrol bombers and flying boats and land-based fighter-bombers. The aircraft carrier had replaced the battleship as the Fleet’s capital ship and its aircraft were now strike weapons in their own right. The top scoring fighter ace with 17 victories was Commander Stanley Orr, the Royal Marine ace was Ronald Cuthbert Hay with 13 victories. After the war the FAA needed to fly jet aircraft from their carriers. The jet aircraft of the era were considerably less effective at low speeds than propeller aircraft, but propeller aircraft could not effectively fight jets at the high speeds flown by jet aircraft. The FAA took on its first jet, the Sea Vampire, in the late 1940s. The Sea Vampire was the first jet credited with taking off and landing on a carrier. The Air Arm continued with high-powered prop aircraft alongside the new jets resulting in the FAA being woefully outpowered during the Korean War. Nevertheless, jets were not yet wholly superior to propeller aircraft and a flight of ground-attack Hawker Sea Furies downed a MiG-15 and damaged others in an engagement. As jets became larger, more powerful and faster they required more space to take off and land. The US Navy simply built much larger carriers. The Royal Navy had a few large carriers built and completed after the end of the war but another solution was sought. This was partly overcome by the introduction of a Royal Navy idea to angle the flight deck away from the centre line so that the aircraft landing had a clear run away from the usual forward deck park. An associated British invention, intended to provide more precise optical guidance to aircraft on final approaching the deck, was the Fresnel lens optical landing aid. Another Royal Navy invention was the use of a steam powered catapult to cater for the larger and heavier aircraft (both systems were adopted by the US Navy). Defence cuts across the British armed forces during the 1960s led to the withdrawal of existing carriers and cancellation of replacements including the CVA-01 design. A new series of small carriers, the Invincible class anti-submarine warfare ships (known as “through deck cruisers”) were built and equipped with the Sea Harrier a derivative of the Hawker Siddeley Harrier VTOL aircraft. These carriers incorporated an upswept forward section of the flight deck that deflected the aircraft upward on launch and permitted heavier loads to be carried by the Harrier, for example in weaponry, and the system was used extensively in the Falklands war. The Harrier went on to form the basis of the Royal Navy’s fixed-wing strike forces. Two new Queen Elizabeth class carriers able to operate the F-35B short take-off and landing variant of the US Lockheed Martin Lightning II aircraft are under construction; it is not certain if both carriers will enter service or the number of aircraft that will be purchased. Helicopters also became important combat vehicles starting in the 1960s. At first they were employed on the carriers alongside the fixed-wing aircraft, but later they were also deployed on most smaller ships. Today at least one helicopter is found on all ships of frigate size or larger. Wasps and Sea Harriers played an active part in the 1982 Falkland Islands conflict, while Lynx helicopters played an attack role against Iraqi patrol boats in the 1991 Gulf War and Commando Sea King HC4s as well as the Lynx HMA Mk 8 from HMS Argyll, assisted in suppressing rebel forces in Sierra Leone. In 2000 the Sea Harrier force was merged with the RAF’s Harrier GR7 fleet to form Joint Force Harrier. The Fleet Air Arm began withdrawing the Sea Harrier from service in 2004 with the disbandment of 800 NAS. 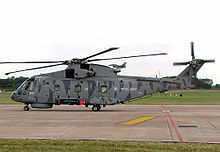 801 NAS disbanded on 28 March 2006 at RNAS Yeovilton (HMS Heron). 800 and 801 NAS were then combined to form the Naval Strike Wing, flying ex-RAF Harrier GR7 and GR9s. On 1 April 2010, NSW reverted to the identity of 800 Naval Air Squadron. The Harrier GR7 and GR9 retired from service in December 2010 following the 2010 SDSR. As of 2010, the Fleet Air Arm has approximately 5,200 personnel, which represents over 15% of the Royal Navy’s total strength. The Assistant Chief of Naval Staff (Aviation & Carriers) is Rear Admiral T A Cunningham. The FAA operates fixed-wing and rotary-wing aircraft. The FAA uses the same designation system for aircraft as the RAF. Three types of fixed-wing aircraft are operated by the FAA for training purposes: pilot training is carried out using the Grob Tutor while, from March 2011, observer training is done using four Beechcraft King Air 350s. The third type is the Hawk T1, which is used to simulate enemy aircraft for training purposes including AEW Fighter Control, air-to-air combat and ship attack. Today the larger section of the FAA is the rotary-wing part. Its aviators fly four types of helicopter, and within each type there are usually several marks/versions which carry out different roles. Pilots designated for rotary wing service train at the Defence Helicopter Flying School, RAF Shawbury. The School is a tri-Service organisation consisting of civilian and military instructors (including Naval instructors and a Naval Squadron) that take the student from basic flying through to more advanced flying such as instrument flying, navigation, formation and captaincy. The oldest aircraft in the fleet is the Westland Sea King, which performs missions in several versions. The Sea King HC4 serves as a medium-lifter and troop-transporter in support of the Royal Marines. The HAS5U model operates in the search and rescue and utility roles, while the Sea King HU5 is designed for search and rescue work (although the HAS5Us are often called HU5s as well). The HAS6C is used for assault transport training; and the ASaC7 operates in the AEW role. Intermediate in age is the Westland Lynx. The Lynx AH7s serve the FAA in the observation and anti-armour helicopter roles, but are mainly a light-lift helicopter. Along with the Sea King HC4s, they are part of the Commando Helicopter Force, which provides support to 3 Commando Brigade of the Royal Marines. The surface combatants of the Royal Navy have their helicopters provided for the most part by the Lynx HMA8 aircraft. The Lynx have primarily an anti-submarine warfare role and anti-surface vessel role. They are able to fire the Sea Skua anti-surface missile, which was used to combat the Iraqi navy in the 1991 Gulf War. It can be armed with Stingray air-launched torpedoes and depth charges for anti-submarine warfare, as well as a machine gun. The Lynx was originally envisaged for surface combatants that were too small for the Sea King, but now equips most surface ships of the Royal Navy. The newest helicopter in the FAA is the AgustaWestland Merlin HM1. This has now replaced the Sea King HAS6 in the Anti-Submarine Warfare (ASW) role, and is deployed on the various ships of the Royal Navy. The Royal Navy plans to operate the F-35B from the Queen Elizabeth-class aircraft carriers, replacing the Harrier-equipped Invincible-class aircraft carriers. In the Persian Gulf, the RN sustains a number of commitments in support of both national and coalition efforts to stabilise the region. The Armilla Patrol, which started in 1980, is the navy’s primary commitment the Gulf region. The Royal Navy also contributes heavily to the combined maritime forces in the Gulf in support of coalition operations. The UK Maritime Component Commander (UKMCC), overseer of all UK warships in the Persian Gulf and surrounding waters, is also deputy commander of the Combined Maritime Forces. Although currently the Fleet Air Arm is an all rotary wing force in terms of its front-line operations, the introduction of the F-35B Lightning II will see a restoration of fixed wing operations. An initial order of 48 airframes was made in 2012 to equip the air wings of the planned two Queen Elizabeth class carriers, with the operation split between the FAA and the Royal Air Force, as was the case with Joint Force Harrier. The Fleet Air Arm will obtain a total of 28 AW159 Wildcat helicopters to replace the current Lynx in use on the Ship’s Flights of the Royal Navy’s escorts – this will perform a range of roles including anti-surface and anti-submarine warfare and airborne surveillance. To replace the Sea King in the Commando role, the Fleet Air Arm will receive the Merlin HC.3 fleet currently operated by the RAF – some of these aircraft will remain as HC.3 standard, while the rest will be fully navalised and classed as HC.4. In addition to replacing the Commando Helicopter Force Sea Kings, there is also a project to replace the Sea King in the Airborne Surveillance and Control mission, which has seen a number of proposals put forward, based on the type of aircraft carrier the platform would be expected to operate from. One idea has been to fit the existing Searchwater radar to the Merlin helicopter, while other options have included the E-2 Hawkeye and an ASaC version of the V-22 Osprey tiltrotor aircraft. The Royal Navy signed a £30 million contract for the Boeing Insitu ScanEagle on the 20 June 2013 giving the navy there first UAV when delivered. Fleet Air Arm flying squadrons are formally named Naval Air Squadron (NASs), a title used as a suffix to the squadron number. The FAA assigns numbers in the 700–799 range to training and operational conversion squadrons and numbers in the 800–899 range to operational squadrons. During WWII the 1700 and 1800 ranges were also used for operational squadrons.